EQ8 has been updated and improved to make it easier to use and much easier to navigate. If you upgraded from EQ7 or you just started digital designing with EQ8 you will find this hands-on workshop essential. 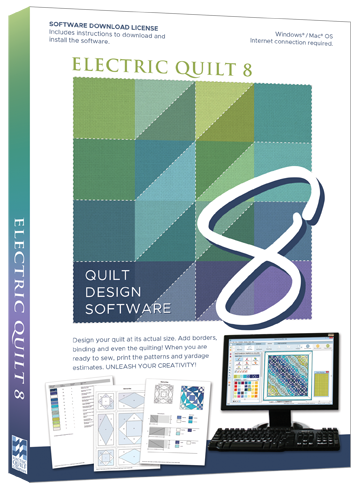 Learn to draw blocks, use and edit the more than 6000 blocks in the new edition, using both piecing and applique drawing tools. Use these blocks to create gorgeous quilt designs using borders, sashing and a wide variety of setting options. You will find this the easiest to use version of EQ yet. As a beta tester for the program, Reeze provides simple instructions and insights into how the program works and how you can make the most of it for your needs. Requirements: Laptop with EQ8 loaded and activated prior to class. You must bring a mouse and your power cord.